It was another beautiful weekend in Boston which I enjoyed walking around the city with my husband. The weather was perfect, the sun was shining and it wasn’t too windy either. 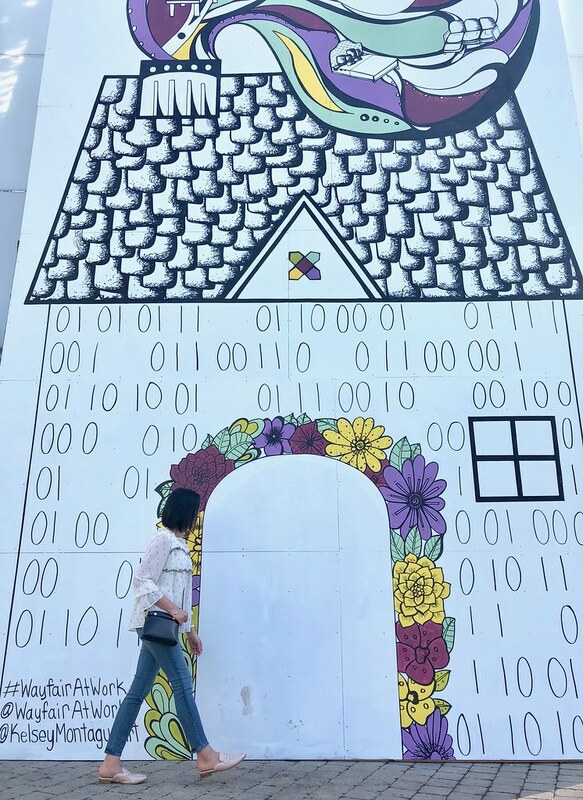 We tried but failed to get a cute shot by this adorable new wall art at the Rose Fitzgerald Kennedy Greenway. Thanks so much for your patience while I update my reviews for the items I shared in my previous post. I work full-time and my blog is my part-time side hustle but sometimes in my obsession I can get carried away but I recognized that I really needed to decompress. By the way, I really enjoyed hearing from those of you who shared your favorite finds and savings with me! The extra 15% off cardmember discount was too good to miss and even when the current sale expires there’s still plenty of opportunity to use it before the offer expires on 10/29! 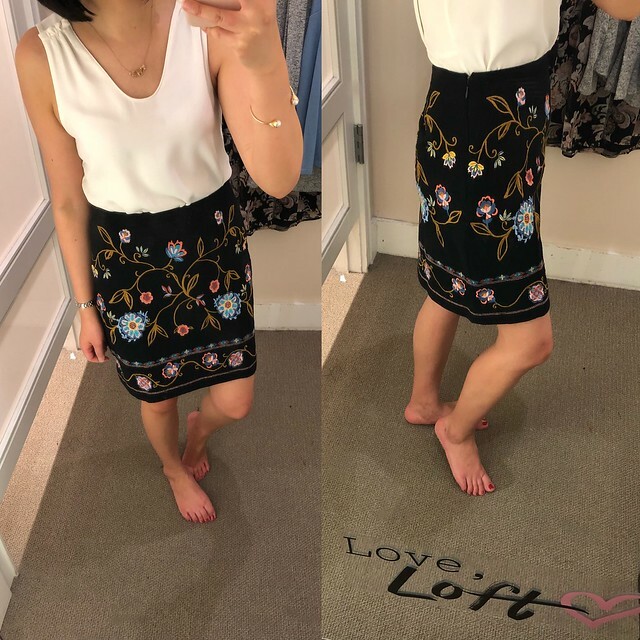 I tried on this embroidered skirt out of curiosity since LOFT featured it on their Instagram last week. The embroidered detail is gorgeous and it reminds me of Anthropologie’s style without the hefty price tag especially on sale. Call me crazy but I didn’t buy the skirt despite the ability to get it for 68% off (explanation on further discounts found at the end of this post). I’m not much of a skirt person in recent years since they always feel short and even shorter when I sit down. The constant tugging at the hem (skirts never seem to stay at my waist and they keep riding up) bothers me so I tend to prefer dresses over skirts. Size 0P measures 27″ in the waist and 17.5″ total length. I found that it runs true to my usual size at LOFT. For reference I’m 5′ 2.5″ and 110 pounds. Su recommended this fuzzy cardigan and I was skeptical of the material but it does look cuter on if you give it a chance. It’s not my style so I passed but if you like soft and fuzzy knits then try this cardigan. I found that it runs true to size for an oversized fit however the sleeves run longer and look best pushed up. I purchased this dress in size XSP for $28.55. It runs large for a swingy but flattering fit. Refer to my review of size XXSP here. Luckily size XSP wasn’t too short compared to size XXSP. I love this floral print for the fall. Su suggested pairing the fuzzy cardigan with the dress and I thought it was a cute look worth sharing. 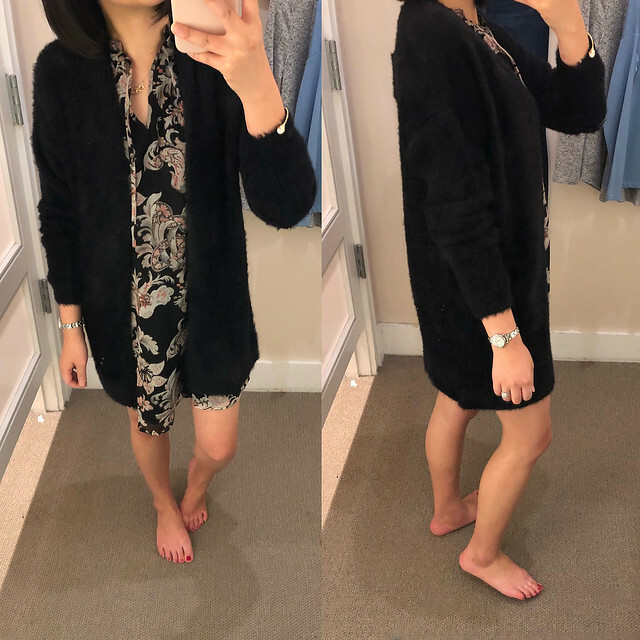 Now I’m on the hunt for a plain black long cardigan since I passed on this fuzzy cardigan. 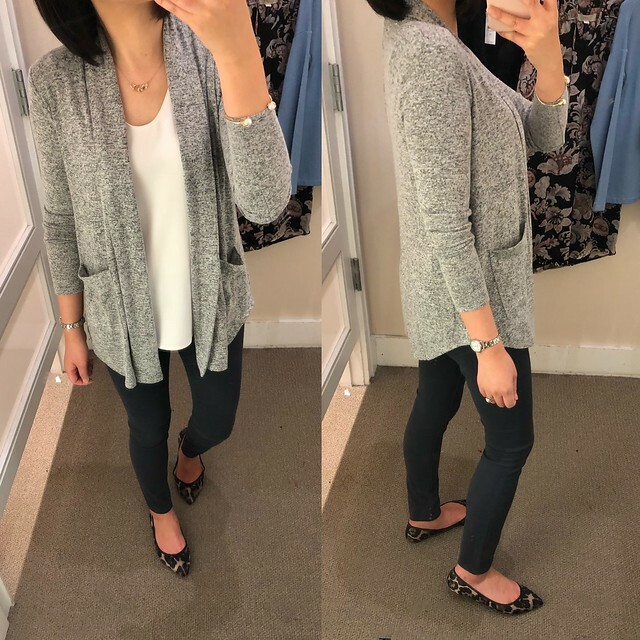 I bought this cardigan last year in size XS regular (see it on me in this post) but the sleeves and length were always longer than I preferred. I re-homed size XS to a slightly taller Instagram friend of mine. I was delighted to find that LOFT restocked this popular cardigan again this year. It was just my luck that I found the last size XSP in store and I purchased it for $17.06. I found that this cardigan runs true to size. 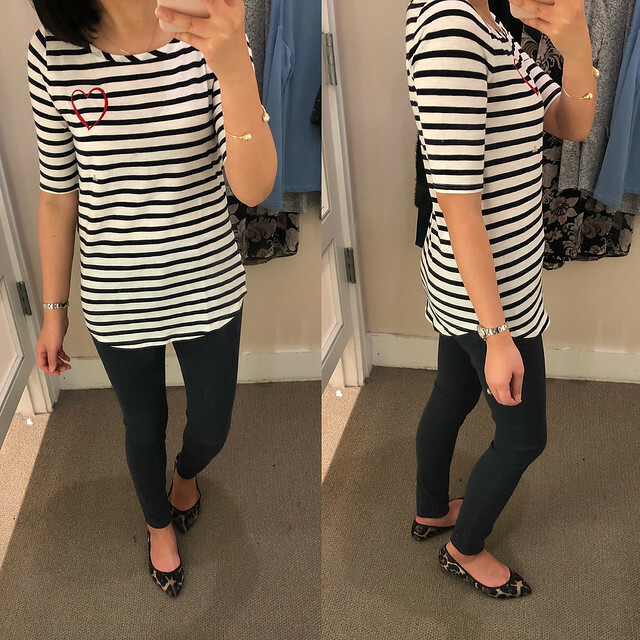 I wanted this striped tee when it popped up online but since it didn’t come in petites I never ordered it. 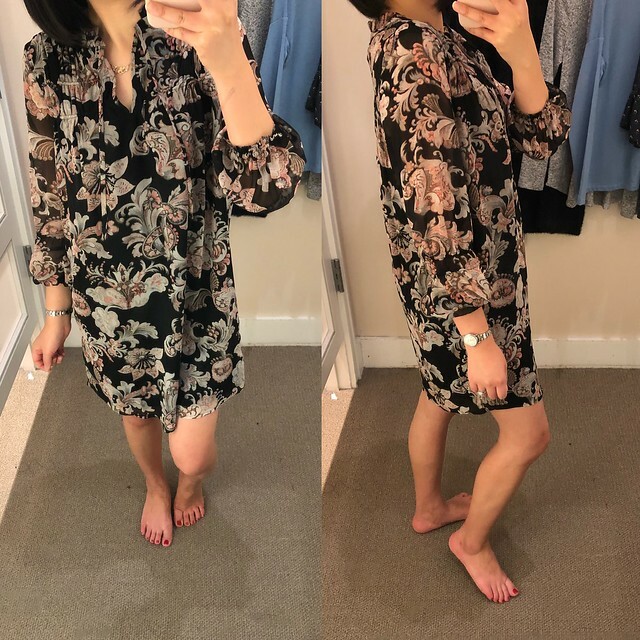 I tried on size XS regular and I found that it runs true to size. I wish this tee was offered in petites since the overall length is too long on me. The fit and length of this tee is similar to LOFT’s popular vintage soft tees. I purchased the new coastal grey color for $22.15. I found that this year’s version of the popular sateen leggings runs one size smaller. I couldn’t even pull on size 25P and I usually take size 25P or 00 regular in LOFT jeans. The measurements of size 26/2P are: 29″ waist, 26″ inseam, 9″ rise and 9″ ankle opening. Su (my fit twin) said her local LOFT store had both shades of greys and for whatever reason the shalestone grey color fit more snug. Like me Su also got these pants in size 26/2P in coastal grey which is a dark grey. Refer to my previous review to see the autumn sage color. A few of my followers noted that there are two grey colorways this year. You can see shalestone grey, costal grey and autumn sage in this picture. The twist in the back of this top looks like a bow as seen here. Unfortunately the back slit is a bit too low so my bra strap was showing and I had to pass on this top. Size XS regular has a swingy fit and runs wide as seen by the excess material on the sides. 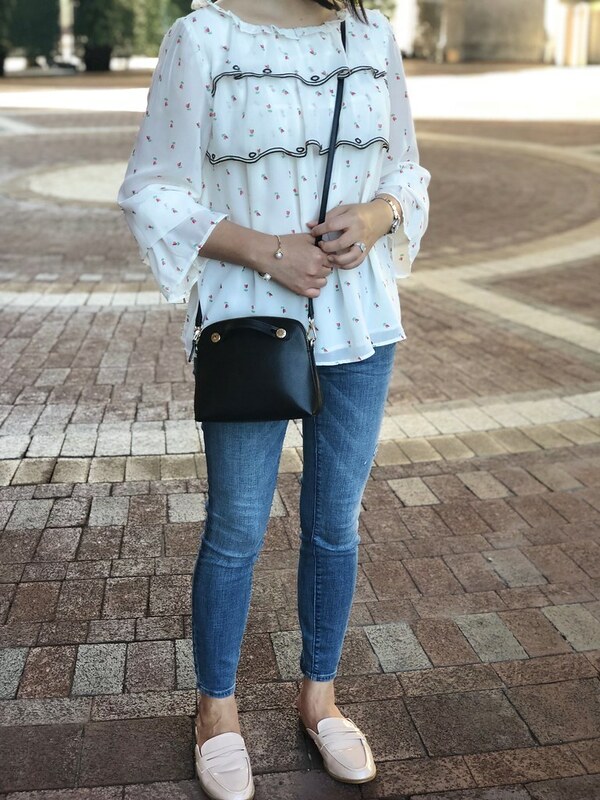 I love the floral print on this top which I purchased for $17.06. I was so happy to see size XXS regulare in store and I found that it runs true to size. 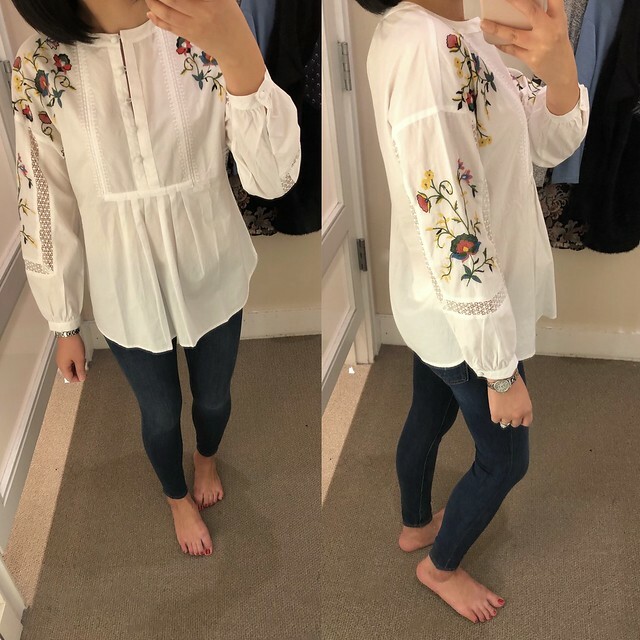 My friend Jenna said she read the online reviews that the floral print is upside down but both our tops didn’t have this issue. I love the little ruffles along the sleeves for added interest. It’s currently sold out online but definitely keep an eye out for pop-backs. Update 10/25: This top is slightly sheer despite the darker print. I was going to return this top but I just sold it to one of my insta-friends who is close to my size. Did you catch a glimpse of this top on LOFT’s instagram as hand modeled by @abbeydenora? 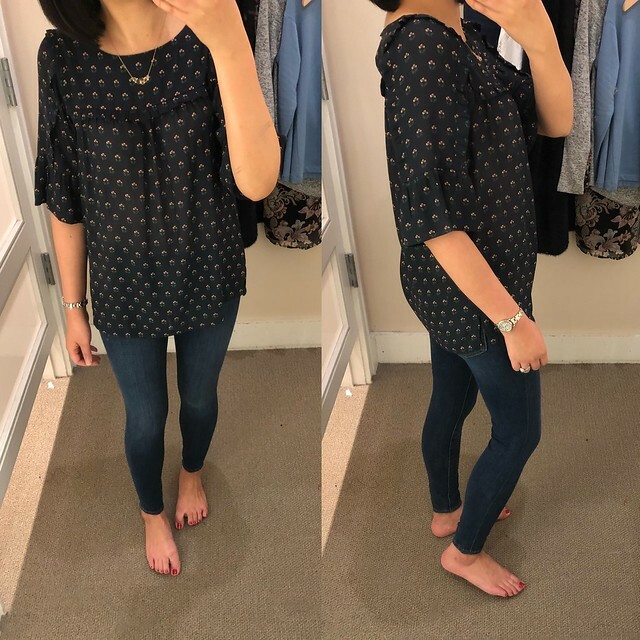 I tried on this top in size XXSP which I found fits like size SP. I recommend going down one to two sizes for the best fit. The material has some structure to it and it’s not too thin so a layering cami is optional. 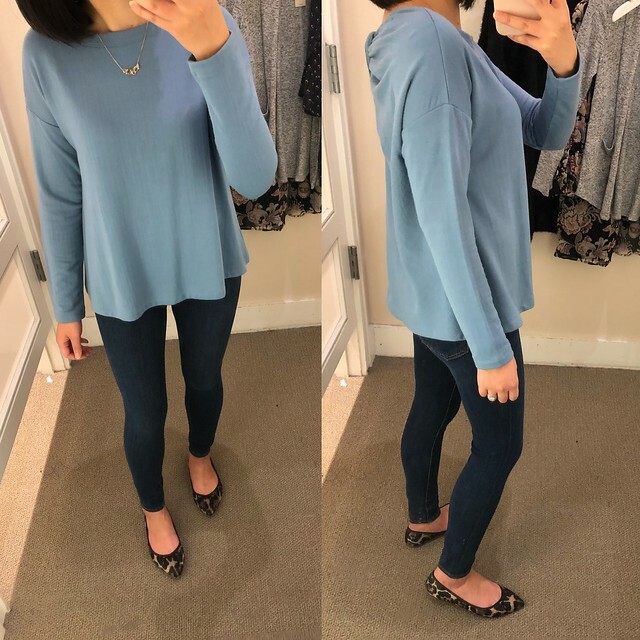 I was interested in these new performance denim leggings but a bit underwhelmed by the lighter wash (I am more biased towards mid-dark wash jeans anyway). 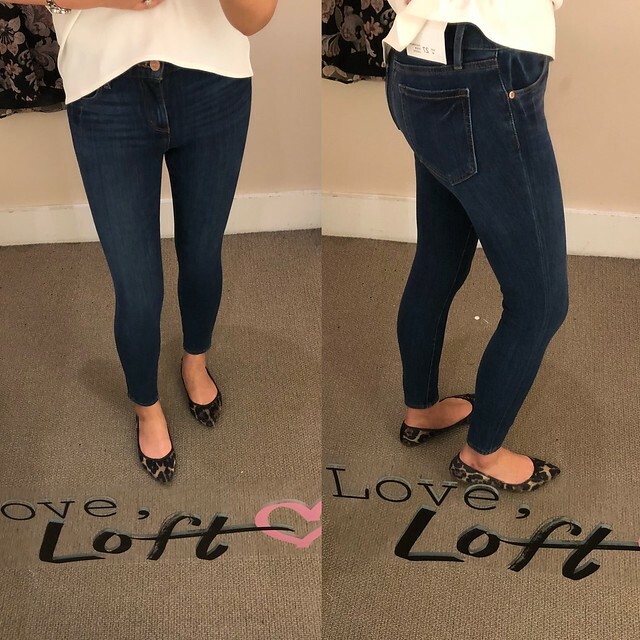 This style fits very small so I recommend going up two sizes from your usual size in LOFT jeans. The fit through the legs is very snug and it will look too tight and even more so if you have thighs or calves. The measurements of size 26/2P are as follows: 27″ waist, 25.5″ inseam, 8″ ankle opening. The 25.5″ inseam is slightly too short for my preference so I may try them on in regular missy sizes for a longer inseam in a future visit. 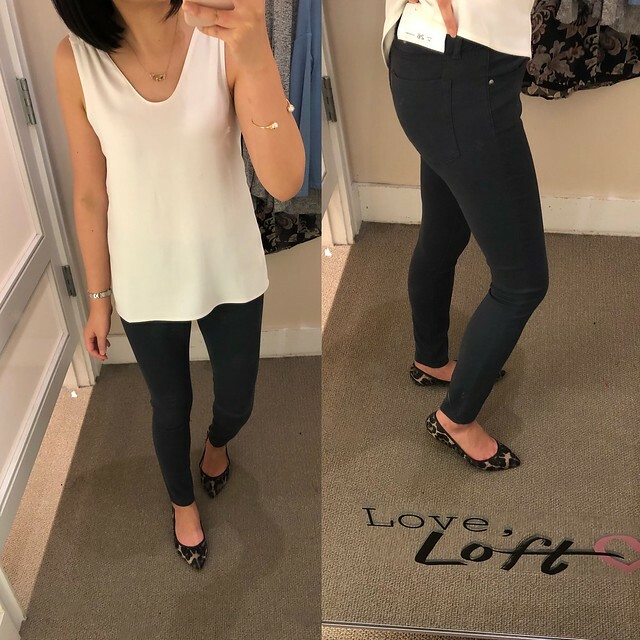 Update 10/28: I tried on size 27/4P again last night and I loved the exact pair I tried on. Out of curiosity I ordered sizes 25 and 26 regular when it was 60% off the other night so I’ll provide an update on those sizes when I receive them. 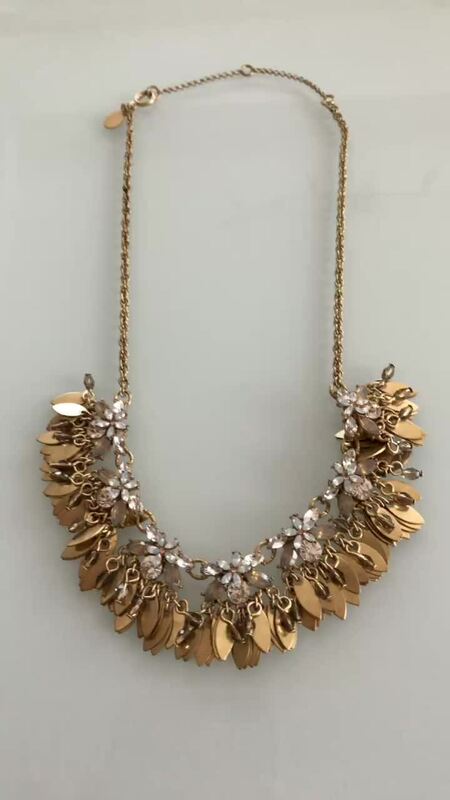 This new statement necklace caught my eye since it’s very different from LOFT’s usual style. I purchased it for $14.18. This necklace is new in stores first. It’s not sold out online since it’s a new arrival and the item availability has not been updated online. If you’re calling in stores to check on the availability it is item no. 456810 and retails for $44.50. Update 10/24: This necklace is now available for purchase online and they also have the matching earrings! 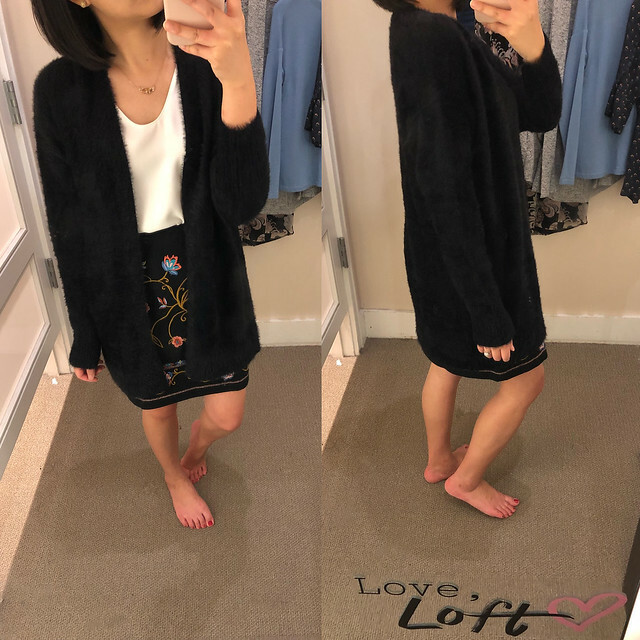 Extra 25% off with my LOFT Cares Card (details here). Extra 10% off full-price promotional tops all October long when you use your LOVELOFT card. Extra 15% off your entire purchase in stores or online when you use your LOVELOFT card and code LOVELOFT15. Save this offer to your mobile wallet by texting LOFT15 to 28162. Valid 10/12/17-10/29/17. Refer to this page for daily sale alerts, extra coupon codes and shopping tips. You can also follow me on Instagram where I always share the latest sales and coupon codes via my stories.